We have published several articles about dementia in the past. As everyone knows, the most common type of dementia is Alzheimer's disease. In this issue, we'll tackle about the second most common type of dementia called Lewy body dementia (LBD) or Dementia with Lewy bodies (DLB), of which 10 to 15% of diagnosed dementia belongs to this type. This second type of dementia has completely different symptoms from Alzheimer's and is quite difficult to diagnose. In this article, we'll let you know how you can identify Lewy body dementia, including the best methods you can apply to improve the symptoms. Lewy Body Dementia Causes Visual Hallucinations! One of the major symptoms of "Lewy body dementia" is visual hallucinations. Lewy body, as they call it, is an abnormal protein that develops in the brain, and interferes with the processing of visual information. Lewy bodies are also found in Parkinson's disease. 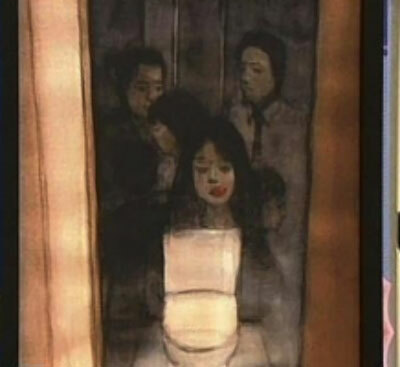 The illustration below is an artist's sketch of what an LBD patient may possibly see when going to the toilet. This particular hallucination can make the patient afraid of going to the bathroom alone. 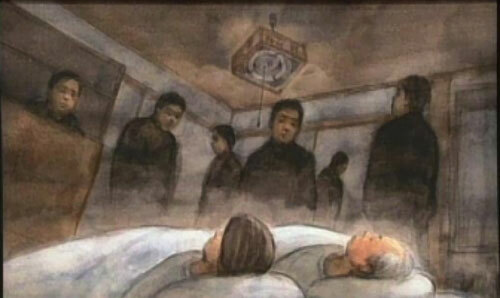 The second picture below is another artist's sketch of what an LBD patient may possibly see after waking up at dawn. The patient may feel that unknown suspicious-looking people are standing around the room. What the patient sees can look very real that they won't think of it as an illusion. How to Determine "Lewy Body Dementia"
Since many LBD symptoms primarily affect the "vision", the hallucinations can look very real in an LBD patient's perspective and will be difficult for them to differentiate reality from illusion. Therefore, it is vital that a family member or caregiver knows how to spot these symptoms and be able to notice it as early as possible. Other symptoms like depression, constipation, and excessive sweating also happens often among Lewy body dementia patients. If two or more of these symptoms are seen, then there's a high likelihood of Lewy body dementia. It is recommended that you consult a doctor as soon as these symptoms are spotted to determine if the patient really has this condition. Are there medical treatments for Lewy body dementia? Medically, it is not possible to remove Lewy bodies that have developed. Medications that are available in the market may only relieve symptoms like hallucinations or visual problems. So far, the combination of medical care and support from the family can help improve the symptoms. Because medications and drugs can worsen Lewy body dementia symptoms due to side effects, it may be better to try home remedies with the help of family members. 1. Avoid Denying on the Spot What the Patient Sees. First, listen firmly on whatever the patient is trying to tell you. Ask things like "What it looks like? ", or "What's unpleasant?" People with Lewy body dementia can experience confusion so you need to help them cope with the condition by listening and being supportive. 2. Tell the Patient That What They See Is Not Visible to You and Other People. It is equally important to tell the patient that what they see is not visible to you and other people. This can help convince the patient and gradually, it will make them think that it may possibly be an illusion. 3. Reduce clutter around the patient's surroundings. Modifying the patient's surroundings can help prevent an LBD patient from misperceiving objects around and cause hallucinations. For example, dusts or dirt around the wall may look like insects, and cluttered objects may form a pattern that may look like animals to an LBD patient. Having a neat and clean environment is a must. It will be less stressful for the patient as well. 4. Divert the patient's attention to non-visual things. Because Lewy body dementia mostly causes visual hallucinations, activities like listening to music and massage therapy can help the patient feel relaxed and stay away from distractive things. The PYRO-ENERGEN is highly effective against Alzheimer's disease, and Parkinson's disease, especially when the therapy is applied during the early stages of the disease. 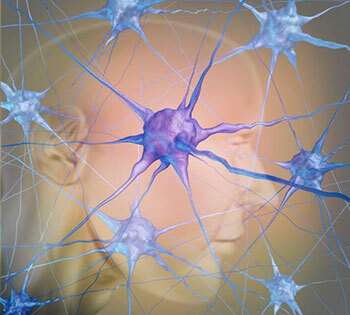 Also read article "PYRO-ENERGEN Treatment Against Alzheimer's Disease". Just like viruses and cancer cells, we strongly believe that Lewy bodies are byproduct of the outside negative energy force. Read our theory "Root Cause of Cancer and Viral Diseases Revealed". Since Lewy bodies are abnormal proteins that also develop in Parkinson's disease and are closely associated to other dementia disorders, the PYRO-ENERGEN can be equally effective to Lewy body dementia.